ULSTER BANK HAS this evening moved to reassure customers that next week will be the “final week of any significant delays”. According to the latest statement from the bank, there will be gradual but noticeable improvements over the coming days, but said that it expects that “by the week of the 16 July the vast majority of customers will return to a normal service”. The statement adds that “there may be some final reconciliations required to customers’ accounts”. The chaos-hit bank will be opening more of its branches this weekend as it struggles to deal with a backlog of customer payments. Meanwhile RTÉ reports that some customers have been charged twice for transactions with some payments being taking out twice and some salaries being lodged twice. The bank has said that no customer will be out of pocket as a result of the fiasco. Ulster Bank has also said that customers can use their credit cards to withdraw money from ATMs without incurring cash advance fees – but only if the money is paid back within a month. Email “Ulster Bank: some customers may be waiting another week for normal service”. 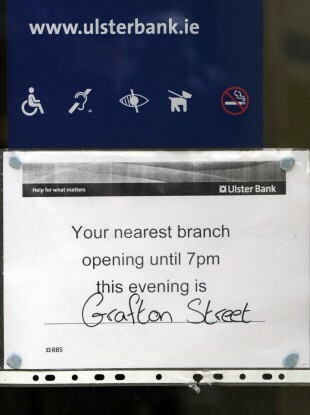 Feedback on “Ulster Bank: some customers may be waiting another week for normal service”.